Genevieve Swiss Industries is the only source of quality compact broaching heads designed for Swiss Type machines. 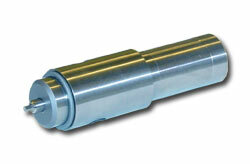 Our rotary broaching heads are the solution to solving tough application problems where confined tool space is an issue. Our on-center, non-adjustable rotary broach holders also save you time with their easy set-up, decreasing machine downtime and increasing productivity. Our Rotary Broach holders feature some of the smallest head dimensions available to the industry! These On-center Rotary Broach Holders are intended for use in Swiss Type Lathes and Gang Style Lathes that are accurate to the work centerline within a few tenths of a thousandth. Capable of creating hex broach forms anywhere from .040" - .375" these broach holders can handle nearly any size required by the Swiss Machinist. The 2160 Series Rotary Broach Holder is our most capable compact Swiss-Style Broach Holder. Able to fit into nearly any tight tooling configuration, The 2160 Broach Holder solves tooling problems and increases productivity by eliminating secondary broach operations. This broach holder is the Original and Best choice for Rotary Broaching on Swiss type CNC machines. Field proven and used for years by the Medical Implant as well as Aerospace manufacturing industries. Can also be used in vertical machining centers. NO CENTER INDICATING REQUIRED - LIGHTNING FAST SETUP! "The Original Swiss-Type Rotary Broach Holder" by Genevieve Swiss & PCM® S.A. The industry's smallest Swiss-type rotary broach holder fits into even the smallest of Swiss-type machines. Ideal for use on micro broaching applications such as dental implants where the profile to be achieved is under .080"
This unit is NOT on center by default. A .454mm offset must be programmed to align the axis of the broach with the axis of the workpiece when broach tool OAL = 13mm. This enables small hole broaching under 2 mm. 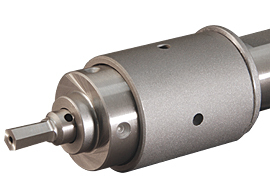 The 2100 Series is a cost effective rotary broach holder that delivers similar results as the 2160 Series. 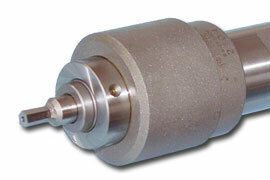 Contains the 1° angle required to obtain the wobble broaching action. Maximum thrust that can be applied to the bearings is 900lbs. On Center design that does not require adjustment. - SWISS MADE PRECISION by PCM® S.A. Thank you for taking the time to visit our site. Please do not hesitate to call or email with rotary broaching application questions or if you need help deciding which tools are right for your job. All Images and Content ©Genevieve Swiss Ind. Inc.